Learning how not to sweat (but to quickly and easily negotiate) the small stuff in your marriage is a darn good idea. I wrote about that last week in How To Negotiate The Small Stuff. This week, what about the big stuff? Well, what IS the big stuff? whether and where to worship. However, from years in the trenches helping couples navigate some stormy waters, I’ve come to see the definition of “big stuff” differently. For most of us, the big stuff we have to negotiate in our long term relationships gets defined by what matters to us as individuals that we disagree about as a couple. That could look like the list above, for sure. But what if you and your partner both feel similarly about these things? Then those things – like buying a house and whether to have kids – become the small stuff because the process of negotiating the hows and whys and whens are non-issues. You both agree. No problem! and a host of other things that you and your partner might disagree about, whether they seem objectively large or small? 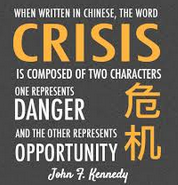 The rather well-worn old Chinese-character-for-crisis metaphor works well here. Areas of disagreement are both a danger and an opportunity. doing damage by the way you go about negotiating for what you want. getting to build your creativity as a couple as the two of you co-create a both/and solution that brings you closer, inspires cooperation and confirms your mutual respect. So, here’s the “How-To-Negotiate-The-BIG-Stuff” method I recommend. In blue type is an example of what by any “normal” standards would be a “small stuff” item. But see how it became a “Big Stuff” for one couple. Usually “Big Stuff” only becomes “Big Stuff” after a few rounds of unsuccessful negotiations. Two people won’t know what they disagree about until they disagree. So, after a few rough and unsuccessful attempts to have things go as you wish, you might decide you want to have a real conversation to sort things out. A real negotiation to put this issue to rest. Not by “winning” I hasten to add. But by coming together as fellow explorers, fellow solution-seekers, to see what you can both learn about one another and discover about how to move beyond whatever the gridlock is. For couple Frank and Heidi their differences regarding how to treat their dining room table after meals went from “cute” to “amusing” to “touchy” to “frosty” to “All-out-hostile” over the course of a few years. Heidi loved a “Zen” space. She wanted the dining room table cleared off after each meal. She needed the salt and pepper or sugar put away; the mats shaken and taken off the table and the table wiped down. Frank hated having to put out for every meal what should have been out since the last meal. He loved having the salt, pepper, ketchup, sugar, mats and even extra cutlery out and on the table. Why create work? At first they found it sort of quaint that they felt so differently about this. They initially did what the other wanted. Frank would put stuff away while singing a song about the department of redundancy department. Heidi would leave stuff out – but way too much stuff… things that might go off like cream, mill and OJ. But after a couple of years the battle lines were drawn. Frank never put anything away at the end of a meal. Heidi put everything away at the end of a meal. Someone was always unhappy. #2 Get curious about why this bothers you. Here are some questions to guide your curiosity. What precisely is this flare of disagreement about for you? What do you wish your partner would do instead of what they actually do? What value of yours seems to be compromised by the actions of your partner? What story do you tell yourself about your partner when things don’t go as you wish? As FRANK thought about what pissed him off it was the inefficiency. He wished Heidi would see things from his point of view and leave the meal-time-necessities there on the table. He valued investing his precious life-energy in things that had immediate and observable feedback – which mico-managing the salt and pepper did not! He valued efficiency – yes! He told himself that Heidi was wasting his time over nothing. HEIDI was on overwhelm. She was super busy. Frank was beyond busy. It was as if their lives were about to fly off the handle and unravel totally. What she needed was some small ritual that demonstrated they were OK.
She wished Frank would simply take the 3 minutes it took to clear the table at the end of a meal. Her values for calm and beauty were being massively stomped on. Heidi told herself that a messy table meant they were heading downhill as a couple. They were loosing the battle for the things that mattered – which was home and family. #3 Get curious about why this might bother your partner. Even though your partner might well be doing what you’ve just done – getting curious about him or her self – it can help to imagine how they might answer this. Knowing what you know about your partner, what might be happening as they appear to resist your request for how to handle this situation? What might your partner wish you’d do in the face of this situation? Do you have any feel for what story your partner might be telling him or her self about you and your actions over this issue? What value might your partner have that could be compromised by what you are doing? Frank thought long a hard. What might Heidi want? He knew she wished he’d clear the table – but he really was not about to concede his valid point. Yet. He figured her clean-table thing had to do with, humm, . . what? Third-grade rules? He could see no value to her request and felt angry and clueless. Heidi thought about Frank, and his life and how full each day was and she figured he was going for efficiency. She knew he wished she’d just let this bone drop…. But she had standards, after all. #4 Ask for some time to talk about the issue. Engage the old grey-matter here. These do not work – right? Tell your partner about your inner homework. Share what you’ve noticed about your values. #6 Invite your partner to share what they have been thinking. Just that. The “Big Stuff” is always about core values. Get curious. What is underneath this stand your partner is taking? Just this. How might the two of you honor one another’s values but do something different? And so they are off. Each now informed about why this matters to one another. Now they can negotiate respectfully towards a win-win, instead of the old win/loose. It’s not always this simple or this easy obviously. But the thing to remember about “Big Stuff” is that what makes it Big is not the objective assessment of the money or effort involved. What makes an issue big between people is the issue’s connection to competing core values. Frank’s value of efficiency clashed with Heidi’s value of calm and clean. Unless you get to the root of these deeper issues, you’ll never find peace. Comment on the fact that neither one of you is up for the conversation right now ( in ohter words, don’t blame anyone). Suggest you take a break. When you are ready, say sorry for your part in the melt down. Remember – keep your eyes on the prize: a long term happy relationship where each of you continues to learn about what matters to one another and to seek to honor those things that each of you values. This entry was posted in Negotiation, Relationship Skills and tagged core values, disagreeing, fighting, marriage negotiation, negotiating the big stuff, resolving conflict as a couple, values are underneath each big fight on August 19, 2015 by gemmautting.